These Pet Rescue level 429 cheats and tips will help you beat level 429 of Pet Rescue. 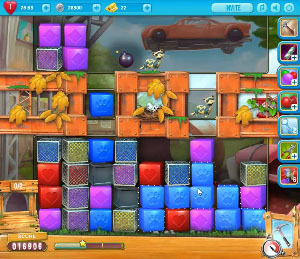 The objective of Pet Rescue level 429 is to save 2 pets and score 15,000 points. The top half will be an easy clear in Pet Rescue Saga level 429. Once you have moved down the board, you will find metal crates surrounding the blocks. Look to break through these crates in order to bring down the pets to the bottom. In order to clear the metal crates around the blocks you will need to make matches with the same color blocks. Look for large combinations to clear out multiple blocks with a single move. Also, you will notice there are bombs scattered around the board. The bombs will fall from the top. Look to save one or two of the bombs until you reach the end of the level. The first two levels do not have as many colors on the them as the last level. This is when you will need to use the bombs the most. The hammer will activate early. However, you want to save it until you reach the bottom of the board. One of the pets may get stuck on one of the boxes and you will have to restart the level if this is the case. Look to use the hammer to break any blocks that may be in your way of collecting the two pets.